Whenever I’m about to leave a place I’ve been for a while I like to take stock of my gear and assess what I need and discard what I don’t. I’ve never documented a packing list so when a friend posted what’s in his bags I thought I should do my own. I travel with a wheeled backpack that comes with a removable day bag, along with a day bag for my laptop, camera gear, and sundry daily items. Some of my nomadic friends are surprised that I carry so much stuff. On the other hand the last time I stayed with a non-nomadic friend they were shocked when I trundled into their house with my two bags. “That’s all you’ve got? !” they said to me. You can’t please everyone, so I’m just showing you what works for me. I don’t consider myself as a minimalist but I have tried to reduce as many items as I can. I’m pleased with my current set up and I have no interest to go carryon only. I’m a slow traveller and I like to linger in places for weeks at a time with a variety of clothes to choose from. As one of my friends recently blogged – Minimalist Travel? Not Gonna Happen! Another shocker for some long term travellers is that I travel with a wheelie backpack. I’ve had recurring back problems over the years which becomes aggravated when I’m carrying around heavy backpacks, so wheels it is for me. I rarely go off road anyway, and if I do my bag can convert into a backpack to carry in such instances. 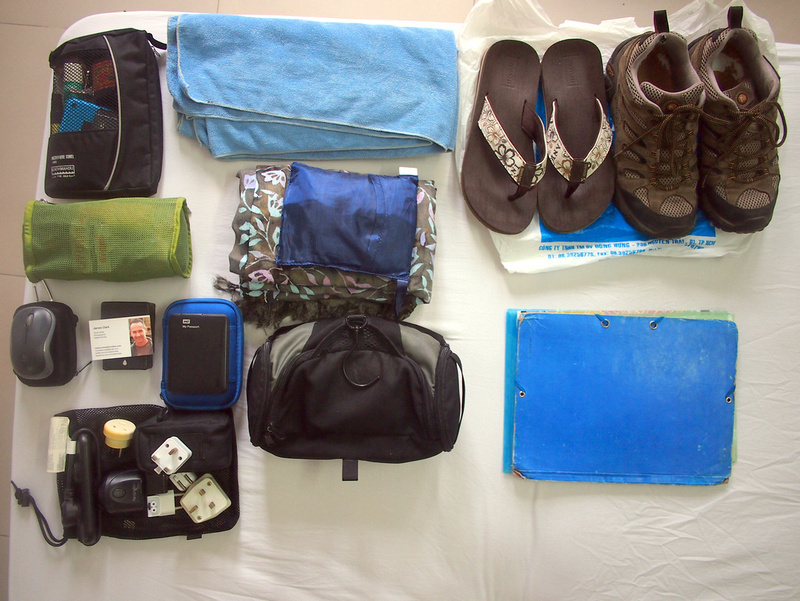 The packing list shown here was for the trip I took at the end of April, 2014 that went for 49 days. My itinerary was Singapore, Bali, Flores, West Timor, East Timor, Bali, Kuala Lumpur, and Bangkok, and returning to Ho Chi Minh City. The trip included moving from place to place in minivans, sleeping in airports, and apartment living in Bangkok for two weeks. Also note that this isn’t all of my worldly possessions. I have boxes and bags in storage in Australia which I have kept should I ever return to take up a place to live in my homeland. After cleaning out my room of accumulated junk and leaving a bag of stuff behind with a friend this was the entire content of main travel bag. This filled my 65L bag and the bag weight was 15KG. I usually keep the removable day bag empty and use it for extra space for those rushed mornings when I can’t be bothered packing up properly. The removable bag is smaller than my laptop bag so I often use this bag for day trips. Breaking it down further here are my clothing items. I have been living in a state of endless summer for the last few years incase you are wondering why I don’t have any winter clothes. * Even though I live in the tropics a hoodie is essential for bus travel in Asia, where the air con is often set to a temperature more suitable for transporting fresh produce. The hoodie has also been useful for those occasional trips to mountainous areas with cold nights. * “10 PAIRS OF BOXER SHORTS!! !” I hear the minimalists exclaim. Yes, you won’t be catching me hand-washing my underwear in the sink every night. 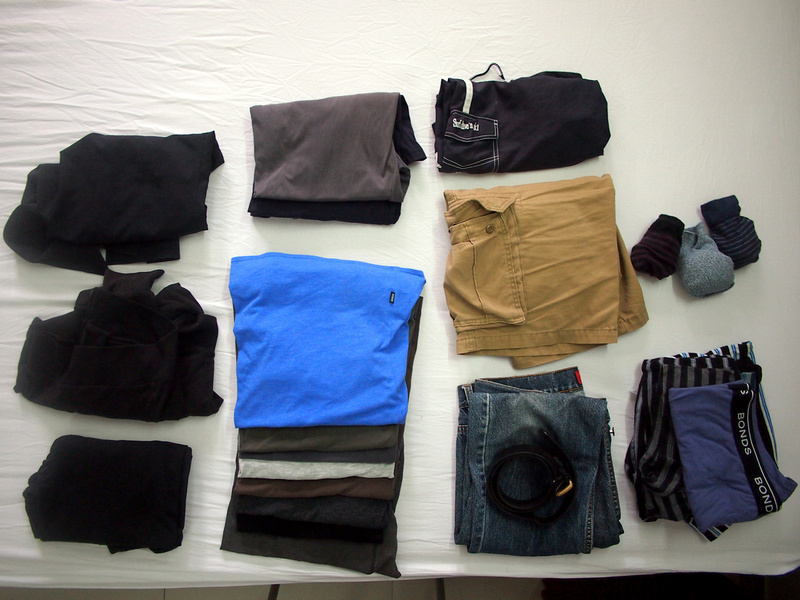 I like to travel with enough clothes to last me 10 days between laundry days. Ideally when I am on the road I would get my washing done once a week, but sometimes that isn’t an option. * Same goes for t-shirts. I like to have a variety of t-shirts, especially when I am spending months at a time in one place. 1 bag of assorted adapters and powerstrip. * I could probably discard some items in the toiletry bag and first aid kit. * My bag of adapters is out of control. This is partly because I have electrical items with Australia and US plugs. I have a universal adapter but they are so heavy and bulky that they tend to fall out of wall sockets. I will be replacing some of these. I’m currently using a Samsonite backpack for my day bag. I don’t know what type it is and it’s not listed at their online shop so it has most likely been discontinued. I bought it at Shanghai Pudong airport when my bag at the time finally disintegrated after 2 years of heavy use. Apart from ripping one of the interior liners I have been satisfied with this bag, but I am on the look out for a new bag. Finding a day bag with the right amount of compartments that looks reasonably stylish has been a challenge. 1 MacBook Air 11.6-Inch Laptop, protective case, and power cable. 1 Olympus PEN E-P3 in camera case. 1 Kindle Paperwhite and charger. 1 iPhone 5 and charger. * Even though I work online I still carry a legal pad in a folder. There is nothing like scribbling down notes to get thoughts and ideas out of your head. * Before getting an iPhone I used to travel with a burner phone and I had my music on the iPod. I have kept my iPod even though I could put music on my iPhone. It saves my phone dying early in the day if I am listening to music all day. 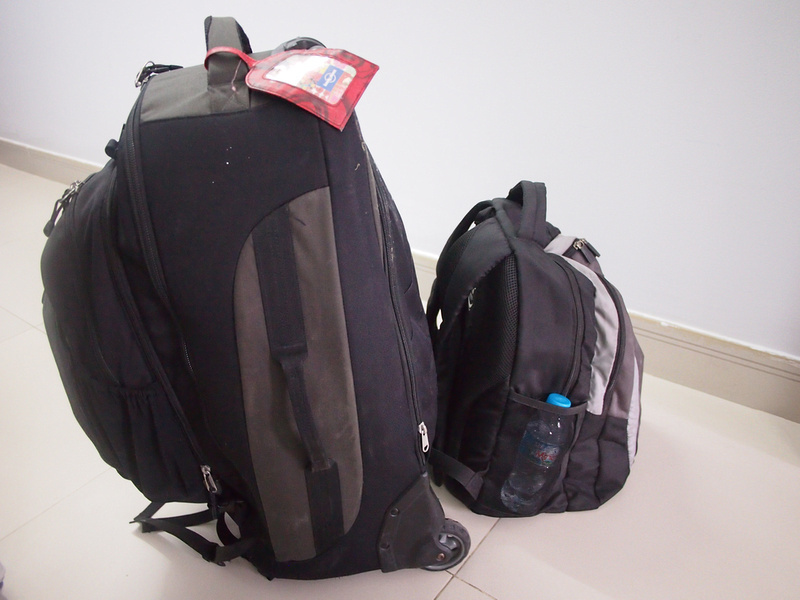 Here is how my two bags look all packed up as I head off to the airport [thanks to Legal Nomads for the photo.]. Nice! I traveled Thailand for three weeks with just a small backpack – didn’t carry any electronics aside from my camera, though, so that kept things lighter. I’m impressed with your packing skills! Nice job on the packing. Seems you have this down to a science needless to say.. Very intrigued by how least you’ve packed but have maintained to have the essentials. Not one of those backpackers washing undies in the sink or shower. A few things I learned doing similar travel was to make a shopping list in a shopping list app that lists all things needed one can miss in the spur of the moment packing/leaving, such as adapters, clothesline, etc. Check them off as you pack. Then, rather than stuffing things everywhere I use good quality ziplock bags and regular supermarket bags to put things in by category, always flat, never folded. The bags slide easily in and out of the day pack and between switching to back pack. Keeping things flat means you never have to dig. I also always wear a Scottevest for easy gate security pass through and keeping valuables on my body, like a pair of chopsticks and a cheap plastic Chinese spoon, both invaluable. Sounds like you have packing down to an art. I agree on the packing things by category. I put heavy items on the bottom of my bag and the t-shirts together and loose items organised in related bags. Greetings from San Miguel de Allende, Mexico. Onward! I’ve never considered the wifi extender but having a look at the one you mentioned it looks super handy! I have tried ExOfficio but I didn’t like the feel of them. I will try the socks at some point (ie when I have an address to send them to 😉 ). I actually own a Minaal bag (I was the first customer on the Kickstarter campaign). They are a nice bag for sure but I haven’t been able to condense my life into the space provided. I will use the bag for short trips when I am home-based somewhere. I tried the minimalist thing last year after I quit my job for two months in Bali/Bangkok/Chiang Mai. It was refreshing at first but there were just some things I needed occasionally which I wanted close to my side – ie: some pants, nicer shoes, etc. Could’t wear my Bintang singlet all day, ha! Still need to give you a list of cafes in Taipei to try out, over banh mi this week! Yes, good to give it a go, but for travellers like us who are moving at a slow pace I would rather have more clothes to choose from! I can usually start an overseas journey with a bag weighing 8kg. Plus carry on board a small messenger bag. Clothing amounts to four of each. Never ten sets of boxers! I wash every second night. The first thing I do is find the best place to hang a washing line in the hotel room. Comes down to that stereotypical story of an English, American and an Australian travelling together. The Aussie hangs his line and washes; the American finds a laundry while the Pom just doesn’t bother. Thanks James! If you are looking for a great bag try Chrome Industries. Its a messenger bag company out of San Frisco…all their stuff is top notch and lots of varieties..on the pricey end but well worth it! Nice work. Gives you completeness and compactness. I saw only one pair of jeans. I guess the other you are wearing. No books to read? I agree kindle is the new way of knowledge but actual book makes a big difference. Thank you for the tips. I live in my bag all year round. 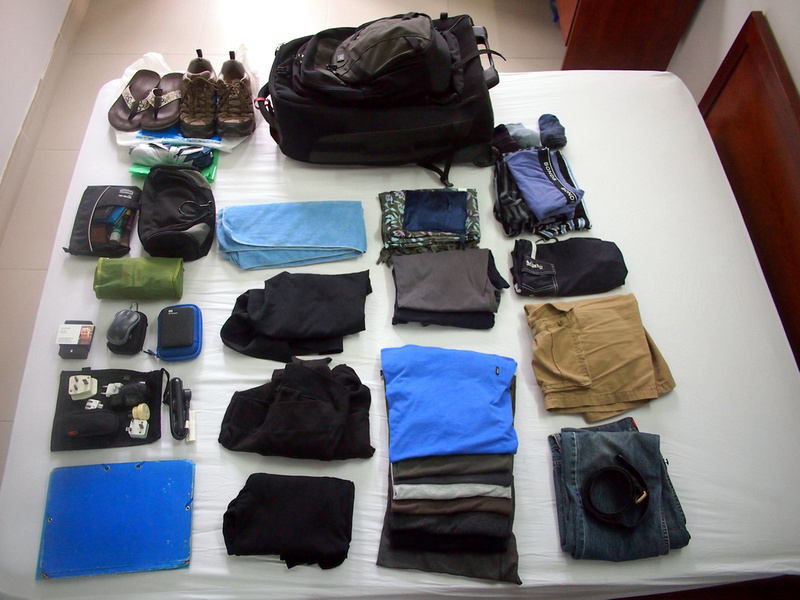 I think this sort of packing list is ok for short trips where one maybe doing a lot of walking, However if you happen to be traveling in asia, (as you were), No need to be so compact. As one rarely has to walk anywhere as transport is so cheap and available everywhere .You just need to use an airport trolley, or wheel yr suitcase. and yr items will be place for You in the taxi, minibus , bus , etc untill U get to yr base, hotel or wherever. Then You can pull out that little back pack and us if for a bike trip up to the mountains or to an island bungalow etc.. I often travel from the island I live on to thailand , or other asian destinations, And carry my board (as I love to surf) and a djembe, (as I like to play percussion) as well as the other little items U included. A suitcase allows One to carry more , and have space for things U may purchase on yr journey.. so yr not compromised. I discovered on my first trip to asia in 1976, backpack was a wrong decision, as Crowded trains and buses with a bag on yr back ends up being a hassle, gets in peoples way and easy for someone to steal when its on yr back. Leave the backpack for backpacking, and enjoy the comfort of a square bag as its easy to find and store things in. Saying all this I will use yr advice for those short 10 day trips to lombok or where ever. “Leave the backpack for backpacking” – I like that idea, and it’s true for me. I recognize that street! 🙂 hung must be sad you’re leaving. I travel with two bags also. Not as much stuff as this, but one of my first trips I didn’t have very much and wished I had a bit more. A backpack and a handbag suits me perfectly. Ha, yes I was wondering how many people would recognize that street. As slow travellers I don’t see the need to go ultra-minimal so backpack and daybag it is for me too. That is so cool! We did a lot of packing and unpacking practice before we really decided what stuff we really don’t need but still Justin and I got a big suitcases each. I know in time we are going to dump some stuff that we hardly use. Are you coming to Chiang Mai or straight to Bangkok? Would love to hang out again! Good luck with your trip! Yes nice to bring your stuff then work it out as you go. It’s not a competition so take what you are comfortable with. Nice breakdown. I pack simialarly but after my last wheeled backpack I went back to a lightweight smaller backpack. Found wheeling around wasnt practical when it came to staris in stations and stuff and the wheeled bags are ew jilos heavier… I tottaly agree with packing lots of tshirts and undies but why so many long sleeve? Also, not sure how you manage without a bedsheet. Especially in se asia I feel I need my own sheets. I actually also bring along a duvet cover and 2 pillow cases. I know it adds quite a bit of extra bulk and weight but most travelers I met also bring along a sheet. Did you used to pack sheets and dumped them to save space or never felt the need? Thanks Loni. Yes the wheels are a pain on stairs, but it is the least worst option for me, that of not carrying heavy gear on my back. I don’t carry a bedsheet but I do have a sleeping bag liner for those times when I am in a cheapo guesthouse. Makes sense. I also suffer from backpain but until I find an actual backpack that also has wheels – one that is lightweight with a proper back system, I am back to regular backpack. Great blog, I just found it yesterday! What are you looking for in a new daypack? A work/commuter bag for the stuff you listed? Or something that can carry more? Let me know, I might be able to make some recommendations from our stuff or others.